Finding the right school can be an arduous task for any college-bound student interested in finding the right balance of academics, location and cost. There are 7 public universities, 17 community colleges and 67 private colleges and universities in Oregon, offering a diverse range of academic opportunities and degree programs, with 246,860 students enrolled in Spring 2015. We have applied our rigorous methodology to the latest education data to rank the best colleges in Oregon, including the top four-year and two-year schools. We hope this will help you gain perspective amidst the state's evolving economic and educational landscape, and to sort through an ever-expanding wealth of education and government data. College is an exciting time for prospective students, and Oregon has many wonderful opportunities to offer at its 25 public colleges, universities and numerous private institutions. With its 40-40-20 goal, "20% of residents with a high school diploma, 40% with a post-secondary credential or associate's degree, and 40% with a bachelor's degree or higher" by 2025, Oregon is proving its commitment to educating its population at all levels and at all institutions within its borders. Earning a four-year bachelor's degree in Oregon can mean a significant improvement in financial stability: The National Center for Education Statistics reported that bachelor's degree holders earned a median yearly wage of $48,500 in 2013 (more than twice that of a person with only a high school diploma). Depending on the major, a four-year degree can provide a significant return on investment; that being said, students should always consider how a program's cost compares to their earning potential in likely careers once graduated. Our ranked list of Oregon's best college programs can be found below. 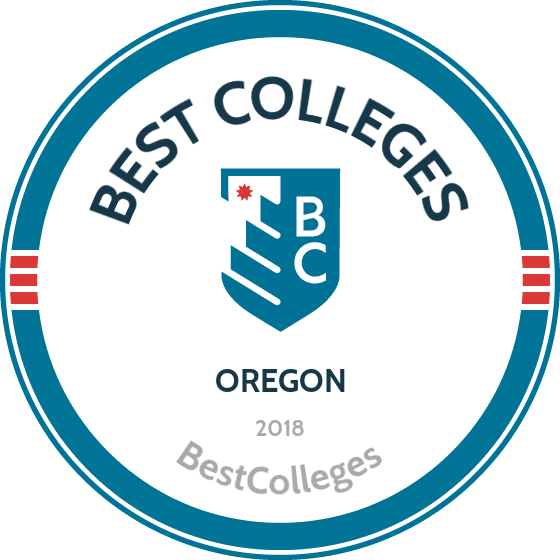 Offering 40 bachelor's programs to its 1,400 students, Portland's Reed College tops the list of best colleges in Oregon. Degrees are administered through the college's five divisions: the arts; literature and languages; history and social sciences; philosophy, religion, psychology, and linguistics; and mathematics and natural sciences. Dual-degree programs are also available through partnerships with other colleges and universities. Every undergraduate student takes a year-long humanities course and writes a senior thesis. A popular campus tradition is the Thesis Parade, which takes place after theses are submitted. Students dress in costume and throw their drafts and notes into a bonfire to celebrate completion. Most classes at Reed College have a conference-style set-up to encourage class discussion, which is further supported by an intimate 9:1 student-to-faculty ratio. There are no fraternities or sororities at Reed, but theme-dorms like the Arabic Culture House and Mad Science Dorm are popular. The college has produced 89 Fulbright students, 31 Rhodes Scholars, and 162 National Science Foundation Fellows. The University of Oregon (UO) was founded in 1876 and has nearly 205,000 living alumni, including: Olympic medalists; Pulitzer Prize winners; seven Oregon governors; and winners of Emmy, Oscar, and Tony awards. UO offers more than 270 science and liberal arts degree programs across its schools and colleges. The most popular majors are business administration, journalism and communication, and psychology. All UO freshmen live on campus in Eugene. Undergraduates number over 20,000 and enjoy a 17:1 student-to-faculty ratio. The UO Sustainable Cities Initiative links students with cities in Oregon to promote environmentally-sustainable solutions in urban planning. Among Oregon colleges, UO is the only Association of American Universities research institution in the state and features 30 research centers, institutes, and core research facilities. UO's Reserve Officers' Training Corps (ROTC) program produces more officers upon graduation than any other civilian school. Founded in 1901 by the Congregation of Holy Cross order of priests and brothers, the University of Portland (UP) is a Roman Catholic college in Oregon. All students take a core curriculum of 13 courses in science, social science, arts, and humanities, in the Catholic tradition of pursuing a variety of disciplines to inform Truth. UP is the only university in Oregon with a College of Arts and Sciences and Schools of Business, Education, Engineering, and Nursing. There are 40 undergraduate programs and 33 minors, and UP's 4,000 undergraduates enjoy a 14:1 student-to-faculty ratio. UP is ranked fourth in the U.S. for student Fulbright Awards. Students can participate in 80 clubs and organizations, like Ultimate Frisbee, Fashion Club, and Engineers Without Borders. The Portland Pilots Athletics include 16 NCAA Division I teams, and sports clubs range from mountain biking to golf. The Moreau Center offers students local and international service opportunities, and Campus Ministry provides retreats and pilgrimages. Mass is held regularly, and chapels are located on campus. In 1868, Oregon State University (OSU) was named the state's land grant institution. Today, it is counted among the best colleges in Oregon. OSU is one of two U.S. universities to also hold Sea Grant, Space Grant, and Sun Grant designations. Its nearly 25,000 undergraduate students can select from among 200 bachelor's degree programs across 11 colleges, including: earth, ocean, and atmospheric sciences; liberal arts; pharmacy; public health and human sciences; and veterinary medicine. Students have access to more than 400 clubs and organizations, 40 intramural sports, and the NCAA Division I Beaver Athletics teams. OSU's campus in Corvallis is located one hour from the Pacific Ocean and two hours from the Cascade Mountains. OSU is the only Oregon university with two Carnegie Classifications: Highest Research Activity and Community Engagement. In 2016, the university achieved a record $336 million in external research funding. Portland's Lewis and Clark College was established in 1867. It offers 29 undergraduate degree majors and 27 minors through its College of Arts and Sciences. Majors include Asian studies, economics, environmental studies, and theatre. Students of this top Oregon college have the opportunity to participate in 30 overseas and off-campus programs in locations like China, Spain, and Australia. All first-year students take the "Exploration and Discovery" course which provides a strong foundation in analytical thinking. The 19 NCAA Division III Pioneers Athletics teams consist of 350 student athletes. There are 100 clubs and organizations, and campus traditions include the Welcome Back Event, Salsa Fiesta, and Hawaii Club Luau. The college recently completed construction of a new residence hall, which is a certified green building. It features a bicycle room and storm water management system. In 2016, five seniors and six recent alumni won Fulbright Awards. Located in Salem, Corban University is one of the best colleges in Oregon. As a Christian university, it delivers education rooted in faith across its programs. Some of the majors available are criminal justice, Christian ministry, forensic psychology, and marketing. Corban provides 15 study abroad programs and a variety of travel-study opportunities, such as the Scholar's Semester in Oxford and the Middle East Studies program. Part of Corban's effort in "Dedicating Heart and Mind to God" is its delivery of many worship opportunities, Bible studies, chapel services, mission trips, and service projects to students. The Reach program is a popular choice for student community service projects that tackle hunger, housing, education, and justice issues. The Corban Warriors Athletics have won six National Christian College Athletic Association championships and two President's Cup Academic Awards. Campus traditions include a Beach Party, Turkey Trot, and talent competitions. One of the best colleges in Oregon is Oregon Tech located in Klamath Falls. This public polytechnic university specializes in combining theory and practice with hands-on learning experiences via labs, clinics, and externships. Forty-two degree programs are offered across the disciplines of applied technologies, engineering, health, applied sciences, communication, and management. The variety of majors include geomatics, health informatics, and echocardiography. Oregon Tech also offers six pre-professional programs, including pre-osteopathic medicine, pre-pharmacy, and pre-veterinary medicine. The 5,200 students have a 20:1 student-to-faculty ratio, and can choose from among 40 student clubs, like the Association of Unmanned Vehicle Systems International, Gaming Community, and Rowing Club. An outdoor program offers rock climbing, trap shooting, and deep sea fishing excursions. Oregon Tech's 305-acre campus is home to events like bands, comedians, and talent shows. Within six months of graduation, 88% of students have a job or are in graduate school. Founded in 1891 by evangelical Quakers, George Fox University is the oldest Christian college in Oregon. Its main campus is in Newberg, which is 23 miles south of Portland, with other locations in Portland, Salem, and Redmond. It serves more than 2,400 undergraduate students with 195 full-time faculty, delivering a 14:1 student-to-faculty ratio. The university's promise is that "each student will be known - personally, academically, and spiritually." There are more than 40 bachelor's degree majors available, including Christian ministries, computer science, politics, and music education, as well as 145 minors. The Richter Scholars Program provides funding for independent research with faculty members. Nearly half of the undergraduate student body participates in a study abroad experience. There are a variety of service opportunities available at George Fox, from an annual Serve Day to service trips during breaks. Alumni include 31st president Herbert Hoover and "Coach" Ken Carter, the subject of the 2005 Coach Carter movie. Northwest Christian University educates students in a Christ-centered environment. The private institution offers several online degree options through its adult degree program, which caters to working adults earning degrees while continuing their current employment. Prospective students can apply by filling out an application and submitting official college transcripts, and NCU does not charge an application fee. Online NCU degrees include a bachelor’s in accounting, business administration, interdisciplinary studies, psychology, and an RN to BSN program. The teacher education program also offers multiple endorsement areas. Distinguishing itself from other online colleges in Oregon, NCU offers incoming students multiple start dates, allowing them to begin classes every eight weeks. NCU also provides a prior learning assessment program, which grants students up to 30 credits for their life and work experiences. Willamette University was established in 1842 as a mission to Native Americans, and today is one of the top colleges in Oregon. Its more than 2,000 undergraduate students may pursue bachelor of arts and bachelor of music degrees across 50 academic programs, such as archaeology, international studies, politics, and religious studies. Some programs offer a BA/MBA or BA/JD degree combination. The university works with area Native American tribes, including the Chemawa Indian School, where students serve as tutors, and the student Native American Enlightenment Association, which organizes the annual campus Powwow. There are more than 40 countries available for studying abroad and 100 student organizations. The university is located in Salem across the street from the Oregon State Capitol and is co-located on its 60-acre campus with the Tokyo International University of America. The university also owns 305-acres of the Zena Forest, which serves as a "living lab" for sustainability academic research. Portland's Multnomah University is a Bible college in Oregon that "prepares students for meaningful careers that serve Jesus," whether in ministry or in the marketplace. Its School of Arts and Sciences offers bachelor's degree majors in accounting, elementary education, and pre-pharmacy, to name a few. Students interested in pursuing careers in ministry can access majors like Hebrew, Bible and theology, and pastoral ministry within the School of Biblical and Theological Studies. Students are required to attend a certain number of devotional activities each semester and must participate in service learning. There are 1,500 options available to fulfill service learning requirements, including working in churches, local ministries, and service organizations. The university offers 12 off-campus and study abroad programs in locations including Nashville, Washington, D.C., Uganda, and Costa Rica. The Multnomah Lions athletics teams consist of men's and women's basketball, cross-country, golf, track and field, men's soccer, and women's volleyball. University alumni include global evangelist Luis Palau and author Randy Alcorn. Portland State University (PSU) is one of the best colleges in Oregon. It serves nearly 22,000 undergraduate students from all 50 states and 89 countries and has a 17:1 student-to-faculty ratio. PSU offers 88 bachelor's degree programs within its colleges. The most popular majors are management, psychology, health studies, biology, and accounting. All students (except those in the Liberal Arts and Sciences College and Honors College) must take the four-year University Studies Program, which provides communication, critical-thinking, and learning strategies. It is supported by mentors, course clusters, and capstone projects. Students pursue field studies and community partnerships with organizations like Intel, the City of Portland, and Portland Public Schools, and donate more than one million service hours annually. PSU has a vibrant outdoor program, along with recreation clubs, intramurals, and student organizations such as Comics Club, Women in Business, Bike PSU, and Greek Life. Southern Oregon University (SOU) is a popular Oregon college, with 60% of students hailing from the state. It offers 33 majors, including environmental science and policy, art, and mathematics, and a variety of minors, such as rhetoric and reason, military science, and Shakespeare studies. Some degree programs offer concentrations, and all programs require university studies, a general education foundation. SOU provides a wide range of mentorships, field studies, internships, capstone projects, and volunteer opportunities to its students. Committed to sustainability practices, SOU features LEED Gold campus housing and was the first U.S. university to be certified as a Bee Campus USA. Student clubs include Poetry Slam, Tennis Club, Impact Campus Ministry, and the Native American Student Union. The campus is located in Ashland, which was named a Top 10 Finalist for "Best Town in America" by Outside Magazine. It is located close to Mt. Ashland, the Rogue River, and Crater Lake National Park, making SOU's outdoor program a successful student organization. Concordia University - Portland is a Lutheran college in Oregon. As a Christian institution, it provides a wide variety of Bible study groups, campus worship opportunities, retreats, and mission trips. There are nearly 1,200 undergraduate students who experience a 17:1 student-to-faculty ratio. Concordia offers 26 majors -- 20 of which have concentrations such as biology, business, english, exercise and sport science, and nursing. Students majoring in education or religion are eligible to take the professional church work minor. Study abroad opportunities include India, Greece, and a semester at sea, among others. The Student Service Corps is deeply committed to mentoring urban youth and has subgroups such as Health Corps and Green Corps, which work in other service areas. On-campus sports include sumo wrestling, volleyball, softball, basketball, and tennis. Students enjoy Concordia's coffee houses and activities like cosmic bowling and laser tag. Ninety-eight percent of students receive financial aid. Founded in 1849 by Congregationalist pioneers, Pacific University was the first chartered university west of the Mississippi River. Today, it is one of the top colleges in Oregon and offers more than 65 majors to its undergraduates. Some of these include art history, chemistry, dance, finance, integrated media, and public health. The university offers a 4-year Graduation Guarantee, which certifies all courses required for graduation will be available to students, but freshmen must sign up to participate. One-third of students participate in 24 NCAA Division III athletic teams. There are more than 60 service, cultural, and Greek Life student organizations and clubs. The Outdoor Adventure program sponsors 15 trips each year, and there are a variety of music, dance, and theatre groups. Located in Forest Grove, students have the opportunity to attend local community events like the Sidewalk Chalk Art Festival, Corn Roast, and Forest Grove Farmer's Market. An Oregon college since 1858, Linfield College is home to 1,700 undergraduates who enjoy an 11:1 student-to-faculty ratio. They may choose from 49 majors within the arts and humanities, social sciences and natural sciences, and pre-professional programs. The college's core curriculum includes four parts: Inquiry Seminar, Diversity Studies, Writing-Intensive, and "Modes of Inquiry," that provides a strong communication, analytical, and philosophical foundation. All first-year students must participate in the January Term, a four-week term between the fall and spring semesters, which features in-class immersives. Since 1999, 29 graduates have received Fulbright awards. The college is consistently named to the President's Higher Education Community Service Honor Roll. There are more than 50 clubs and organizations, 14 performing arts groups, 13 intramural and club sports, and 19 NCAA Division III athletic teams at Linfield. The Monmouth campus of Western Oregon University was founded in 1856. The public institution offers a range of degree options to students, including online programs. WOU distinguishes itself from other online schools in Oregon by focusing on graduate degrees, although the university does offer a number of online undergraduate courses each term. WOU offers five online master’s degrees, which includes criminal justice, interpreting studies, teaching, curriculum and instruction, and information technology. Online learners can pursue a teaching specialization as an elementary mathematics instructional leader or receive an ESOL or a reading endorsement. The university’s flexible programs emphasize small cohorts and an inclusive environment, with average class sizes of 13 students. WOU charges the same online tuition rate for Oregon residents and non-residents. Eastern Oregon University was founded as a teachers college in 1929 and is now a regional public university. EOU runs an expansive online degree program, making it one of the largest online colleges in Oregon, offering more than 35 majors, minors, and graduate programs. At the undergraduate level, EOU online students can pursue majors like communication studies, early childhood education, economics, and fire services administration. The online program also includes minor such as business, physical education, Native American studies, and public policy. The unique integrative studies option lets students combine two minors into a major, allowing learners to customize a degree and maximize their academic experience. At the graduate level, EOU offers master’s programs in education and business. The school charges the same online tuition rate for Oregon residents and non-residents. Founded in 1937, Warner Pacific College is a Christian liberal arts college that emphasizes the urban environment. From its five campuses located around the Portland area, including its main campus in southeast Portland, WP offers a number of undergraduate and graduate degrees, including several online programs through its adult degree program. Warner Pacific is one of the few online colleges in Oregon that confers degrees at the associate, bachelor’s, and master’s level. Online learners can earn an associate of arts in organizational dynamics and a bachelor's degree in business administration, health care administration, or human development. At the graduate level, WP offers a master’s in human services and a master’s in management and organizational leadership. Warner Pacific also offers a number of stand alone online classes each term, allowing students to complete prerequisites or graduation requirements online. Formerly the Eugene Bible College, New Hope Christian College is an interdenominational private Christian institution. In addition to a range of in-person degree options, the school's online education program offers an associate degree in ministry leadership. The online ministry leadership program requires learners to earn 63 credit and can be completed in 26 months. New Hope's online degree in ministry leadership emphasizes preaching and general ministry skills for church and parachurch ministries. Graduates may pursue seminary training after earning the degree. The curriculum focuses on critical thinking, problem solving, and decision-making abilities within a biblical worldview. Applicants must have a minimum cumulative 2.0 GPA or provide a transcript for homeschool courses. Prospective students should also provide evidence of their Christian faith. It is increasingly imperative that students attain postsecondary education to achieve success in the modern workforce. With the cost of living steadily rising, earning an associate degree can be a significant step towards financial stability. Over 370,000 students attend community college each year in Oregon, and 8.15% of the population over the age of 25 hold a two-year degree. Gaining a professional degree is a popular choice for working students, and it can make good financial sense as a return on investment, as tuition is generally more affordable at public community colleges. The national median annual salary of full-time workers ages 25-34 in 2013 was $37,500 for associate's degree holders, a not-insignificant increase from those only holding a high school diploma. Oregon community colleges have an open admission policy, providing equal opportunity to all students and providing support for students who want to transfer their credits to a 4-year program. Students should consult the Office of Community Colleges and Workforce Development website for more information on community organizations and career resources for working students. Tuition is on the rise, and state spending per student has decreased 37.9% from 2008 to 2014. However, some improvements have been made in the past year, with funding increasing 9.7% from 2013-2014. College funding is a "top priority" for the state legislature, and funding initiatives are underway to help bolster state funding of public education. In 2013-2015 funding for public education was up to $465 million (from $395.5 million in the previous 2 year period). These trends are expected to continue to improve in coming years, suggesting a bright future for students seeking affordable, high-quality public education in Oregon. Review this year's selection of the state's best two-year programs below. Located along the lush Cascadian coastline, Oregon Coast Community College is one of the smallest community colleges in Oregon. OCCC’s size is its advantage: small classroom sizes provide faculty members with the opportunity to meet every student. Whether students are recent high school graduates, working professionals with daytime commitments, or simply life-long learners, the school tailors its education opportunities to every student’s needs. OCCC welcomes students seeking specific one-year certificates, students striving to earn an associate degree, and students who intend to eventually transfer to a four-year institution to earn a bachelor’s degree. Because OCCC ensures that each student receives individual support, student resources are abundant. Examples include placement tests to ensure students are in the right classes for their skill level, available and welcoming academic advisors to aid students with program and course selections, and the school’s tutoring center, where students are invited to consult tutors for both curriculum assistance and career advice. Providing educational opportunities to students for over half a century and conveniently located just east of Portland, Mt. Hood Community College enrolls about 33,000 passionate students annually. Whether they’re earning an associate degree or completing the courses necessary for a career in an apprenticeship trade, MHCC ensures that all students receive the support they need. For example, at the school’s Academic Advising and Transfer Center, students can walk in without an appointment and receive general advising, or they can schedule an appointment with an advisor and together create a strategic, cohesive education plan. MHCC encourages students to take advantage of all MHCC resources, including the school’s learning success center, career planning and counseling center, and orientation center. MHCC is also particularly notable among Oregon community colleges for its extracurricular offerings through the school’s study abroad and athletic programs. Serving nearly 90,000 students a year, Portland Community College is not only the largest community college in Oregon, but it’s also the largest educational institution—among universities and college alike—in the state. Students searching for that perfect two-year degree option need not look any further. At PCC, students choose between five different options: an associate of arts Oregon transfer, associate of science Oregon transfer in business, associate of science, associate of general studies, or an associate of applied science degree. PCC’s Oregon transfer degrees prepare students with a solid foundation in writing, science, and math so that they can continue their education at an Oregon public university. The school’s non-transfer degrees prepare students to enter a four-year institution but also focus on the needs of students entering the workforce upon graduation. Whichever degree they choose, students can expect full support from the school’s large staff and plentiful resources, including several campuses in and around the city of Portland, student learning facilities, well-stocked libraries, and dedicated writing centers. Based just south of Portland, Clackamas Community College boasts a 77% degree-related student employment rate. CCC offers students from all walks of life a variety of programs at three conveniently located campuses in Oregon City, Clackamas, and Wilsonville. CCC welcomes incoming freshman who plan to transfer to a four-year institution, adults returning to school to complete a high school diploma, and professionals studying for certification or associate degrees. CCC offers several notable programs, such as its unique urban agriculture certificate, as well as more conventional courses, programs, and certificates. The school’s colorful offerings enrich the school’s famously vibrant surrounding community while the school’s vast variety of courses ensures that it remains one of the most popular community colleges in Oregon. Southwestern Oregon Community College is a two-year college offering many amenities rarely seen outside of four-year institutions. These include dining services, meal plans, on-campus student housing, instructional computer labs and testing centers, and fitness and recreational facilities. These quality services and facilities offer an experience similar to that of four-year colleges--without the expense and commitment demands. Surrounded by the beloved scenery of the coastal Pacific Northwest, Southwestern provides students with the opportunity to earn an associate of arts, science, general studies, or applied science degree from one of the best community colleges in Oregon. Among Southwestern’s many degree programs, students can choose to study anything from baking and pastry arts to marine biology. Whether students decide to enter the workforce after graduation or continue on to a bachelor’s degree at a four-year institution, Southwestern is an excellent option. Chemeketa Community College is a two-year college in Oregon that helps nearly 30,000 students get the education they need each year. The second largest community college in the state, CCC’s main campus is conveniently located northeast of Salem, Oregon’s capital. The school has several other campuses and education centers in the area, including a business-oriented facility, CCC’s Center for Business and Industry, located in downtown Salem. CCC is particularly well known for its Northwest Wine Studies Center and its famous wine studies program, the first of its kind in Oregon. The school’s wine studies program offers three degree tracks: wine business, winemaking, and vineyard management and operations. The Northwest Wine Studies Center is located just west of Salem at Chemeketa Eola, overseeing the Willamette River. Whether a student intends to receive a specialized two-year degree or collect the credits necessary to transfer to a four-year institution, Chemeketa can make it possible. In 2016, Tillamook Bay Community College celebrated its 35th anniversary, marking three and a half decades of providing affordable and convenient education for the Tillamook County region and beyond. TBCC offers associate degrees in a variety of subjects ranging from agriculture and natural resource management to criminal justice and public safety. The school expects to open its cutting edge Partners for Rural Innovation Center in 2017. The center is the future home of TBCC’s celebrated agriculture and natural resources program and it will also function as a local community space. TBCC’s academic approach is student-focused: the school’s degree maps show students exactly what courses are necessary to complete TBCC’s degrees and certificates. This level of transparency allows students to carefully chart their education before enrolling. TBCC’s diverse program offerings, state of the art facilities, and aforementioned degree map approach make Tillamook Bay Community College one of the best community colleges in Oregon. One of the oldest community colleges in Oregon, Clatsop Community College has provided the education that professionals need in Clatsop County community for almost 60 years. CCC’s offerings include degree programs, workforce training, and community education. Specializations include popular fire science and vessel operations programs, which allows students to earn an associate of applied science degree in these subjects. In addition to associate degrees, CCC offers a variety of transfer degree options for students who intend to transform their two-year degree into a bachelor’s degree at another institution. A hallmark of an excellent community college, CCC focuses not only on providing its students with a first-rate education but also on enriching its community: the school hosts a regular series of diverse and innovative events at its performing arts center and art gallery, events that are open to the public. CCC’s main campus is located in the historic and scenic city of Astoria, where it overlooks the Columbia River. One of the best community colleges in Oregon, Blue Mountain Community College brings quality education to four counties in the northeastern part of the state and the Confederated Tribes of the Umatilla Indian Reservation. BMCC enrolls about 9,000 students a year. Each student benefits from BMCC’s small class sizes, allowing professors to provide personal attention to every student. BMCC strives to maintain an active community: the school supports a lively student government and facilitates dozens of student-ran clubs and organizations. Additionally, athletic programs like basketball, soccer, and men’s and women’s rodeo play a prominent role in campus life. BMCC provides students with many options for pursuing their education, including two opportunities to achieve an associate degree and four options for pursuing a transfer associate degree. Students can also choose from among a selection of emphases, including specialization in diesel technology (a degree that trains students to repair and service diesel engines) and criminal justice, which prepares students for a career in law enforcement and corrections. With student ages ranging from nine to 89, Columbia Gorge Community College’s student body clearly represents a diverse population. Located in the middle of the Columbia River Gorge, CGCC’s student body takes advantage of its enchanting surroundings and the college provides students with many opportunities to participate in the area’s popular recreational activities. CGCC draws knowledge-seeking adventurers from all over the world to hike, fish, and windsurf while receiving an excellent education through the school’s diverse educational programs. CGCC also makes credit transfers easy: students who earn their associate degree at CGCC and wish to continue their education at a four-year school won’t need to start over at a new institution. Home to over 5,000 students on its campus in Klamath Falls, OR, Klamath Community College (KCC) plays a vital role in developing the region's workforce. The school administers associate of applied science (AAS) degrees that prepare work-ready graduates, often in as little as two years. All degrees include general education requirements and technical or specialized courses in the major. AAS degrees are offered in popular fields such as accounting, nursing, computer engineering, business administration, and education (with three concentration areas). One of the top community colleges in Oregon, KCC offers an AAS in aviation science with two areas of specialization: airplane and helicopter. Students in the program receive one-on-one training that prepares them for FAA exams, leading to careers as pilots. Students can enroll at KCC on a full-time or part-time basis, and benefit from comprehensive support services including tutoring and career services. Southwesternmost among community colleges in Oregon, Rogue Community College provides students with the option to pursue six different two-year degrees, receive workforce training, or attend 75 technical/career training programs. Since its founding in 1970, RCC has offered students throughout Jackson and Josephine counties the flexibility to choose the educational program that best fits their goals. RCC holds courses at several campuses, including its primary campus—the Redwood Campus—in Grants Pass, the Riverside Campus in Medford, the Table Rock Campus in White City, and the school’s specialized Illinois Valley Entrepreneurial Center in Kerby. The school also operates learning centers in Grants Pass, Medford, and Kerby. Additionally, RCC offers valuable career services for students searching for guidance on resumes, cover letters, interviews, and potential careers to help each student with their job search process. As the oldest community college in Oregon, Central Oregon Community College has been an innovator and trailblazer since its founding in 1949. COCC’s main campus is located in the historic and outdoor-friendly city of Bend. Today, the school oversees additional campuses in three other cities in central Oregon: Redmond, Prineville, and Madras. Students at COCC enjoy on-campus housing and state-of-the-art facilities, including the school’s Health Careers and Science Center, built in 2012 to provide hands-on lab training for students. Students seeking degrees outside of the medical field also choose from an abundance of educational programs. Students have the option to complete an associate of applied science degree and immediately enter the workforce upon graduation, a transfer degree in which students can receive an associate degree while preparing to transfer to another institution, or customize their degree to meet their desired academic goals and receive an associate of general studies degree. COCC also offers students the ability the receive a variety of four-year degrees through its partnership with Oregon State University. The third largest college in the state, Lane Community College offers students courses at five locations in and around Eugene. LCC’s facilities including the school’s Lane Aviation Academy at Eugene Airport and its Small Business Development Center, conveniently located in the city’s bustling downtown. Regardless of their background, students at LCC can choose from a wealth of programs. The school embraces the diversity of its students: LCC has one of the highest Native American populations among community colleges in the United States and the school was the second community college in the nation to open a campus longhouse. The structure houses the school’s Native American studies, American Indian language, and ethnic studies program courses. Appropriate for a school rooted in the beautiful surroundings of Eugene, LCC also enjoys a vibrant athletic culture. Linn-Benton Community College was founded in 1966 to provide local communities with quality higher education opportunities. Nearly half a century later, Linn-Benton continues to serve the community with an average 21-to-1 student-to-teacher ratio, over 30 campus organizations, and nearly 7,000 enrolled students. LBCC provides students with the opportunity they need to pursue an associate degree, certificate, or simply take a class for fun or personal enrichment. Programs and certificates are available in a variety of categories, including agriculture, nutrition, and health care. The LBCC campus features a variety of rarely encountered college resources and features, including a solar gazebo, 3D printers, a green roof garden, and a wood-fired oven for use by the school’s culinary arts program. These assets signal the school’s commitment to providing students with access to state-of-the-art technology and equipment necessary for them to get ahead. If you're thinking about applying to one of the best colleges in Oregon, continuing reading to learn more about living in the Beaver State. Oregon is located in Northwestern United States and is bordered by California, Washington, Idaho and Nevada. The population is 3,836,628 with a median age of 38. The spectacular Columbia River Valley forms the northern border, and the state is home to diverse terrain from lush forested areas, river valleys and the Pacific coastline, to volcanoes, deserts and prairies. Crater Lake National Park is a particularly beautiful and otherworldly location located in the southwestern region of the state. Oregon maintains a mild climate that ranges from wet and oceanic to Mediterranean and semi-arid, depending on season and location. Portland, Oregon's largest city, is undertaking a 5-year Environmental Services Initiative "Grey to Green" to boost green infrastructure. The economy is transitioning from exporting natural resources (timber, agriculture) to manufacturing and high technology services. Unemployment in Oregon is currently 6.9%, with future job growth projected at 34.5%. The state income tax is 9%, and the median household income is $50,036. The cost of living in Oregon is 15.5% above the national average, and average rent for a 1-bedroom apartment is $673 per month, with a median home value of $230,700. State funding for education has declined since the recession in 2008, and currently only 18.49% of the population over the age of 25 has graduated from a 4-year college. Enrollment dipped by 2.5% from 2012-2013, but has increased 27.7% overall since 2008. Oregon public colleges have a 55.8% average graduation rate (ranked #25 in the nation). The average first year retention rate is 79.7%, with an average cost per student of $12,951. The average cost per degree is $53,424. Tuition was, on average, $8,294 for in-state students, and $25,067 for out-of state (higher than the national average of $21,847). Tuition has vastly outpaced the median household income, and as a result, students are forced to take on more debt (especially hard hit are students from low-income families). Tuition at public, four-year colleges has risen 28.8% ($1,924) from 2008 to 2014, and there was also a 2.0% ($171) increase in average tuition at public, 4-year colleges from 2013 to 2014 in Oregon. Lower income students are often deterred as a result, and attendance has fallen in many states amongst lower income constituents. In 2012-2013, the average debt for postsecondary students was $25,577. Debt is a major concern as tuition rises, and students who are seeking funding for college should be sure to plan carefully and explore the numerous grants, financial aid and scholarship options available (see our list of resources below). In 2012-2013, Oregon distributed $139.6 million in financial aid. A number of higher education funding initiatives are underway, including Oregon Promise, a campaign to offer free community college tuition. The Office of Student Access and Completion offers additional resources for postsecondary funding. Students wishing to establish residency for tuition purposes in Oregon should review the state requirements as soon as possible, as this process can be lengthy. If the student intends to live and work in Oregon post-graduation, establishing residency prior to school is a good idea, as tuition costs and benefits are greatly discounted. Intent to domicile in state is established by gathering proof of financial independence, intent to stay and intent to continue employment in-state beyond graduation. Adult students who are thinking of establishing residency must live in-state for 12 continuous months prior to the first day of class, and must be engaged in activities other than those as a student. Exceptions for exemption from nonresident tuition include: non-US citizens who have received a high school diploma in Oregon, and qualified veterans of the US military. These candidates may not be considered Oregon residents, but are qualified to receive discounted tuition. For students under 18, residency is determined by the status of their parents. If a student is financially dependent upon a parent and parents are separated or divorced, residency is contingent upon the residency status of the parent residing in state. Considered a resident if claimed as an exemption on parent's federal tax forms. Other documentation may be required. Adults must provide a permanent physical address, show proof of residency (via rental or purchase agreement), and can provide utility bills, insurance bills, bank statements, paystubs and medical or public assistance cards to verify residency. Regulations for school enrollment and tuition are established by the state government and are investigated by a dedicated residency officer.